LAMP AAC book- "In the Winter"
LAMP AAC book- "Farm Animals"
LAMP AAC book- "I Feel"
A set of Christmas vocabulary flash cards with LAMP - Words for Life - sequences.A great cheat sheet for adults or to help beginner LAMP users. LAMP AAC book- "I want"
This is a set of flashcards to be used with the Lamp AAC. This set contains all of the Kindergarten Sight Words. 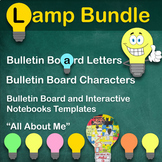 This is a set of First Grade Sight Words Flashcards that includes the Lamp AAC sequences. · This is the 102 core vocabulary words complete with the sequence of hits for the Lamp Words for Life® AAC device. · You can print these and use them as is for beginners that needs a little help. · If you want them smaller then print 2 cards to a page in the printer settings. This is a social story for Trick-or-Treating. It has the LAMP Words for life sequences for each sentence. The same story is in two different ways to present it. The first is for more advanced kiddos and the second way would be more for a LAMP beginner. LAMP AAC book- "Valentine's Day"
LAMP AAC book- "In the Spring"
This is a set of 16 Flash Cards to be used as conversation starters. Each card has the words and the LAMP sequence of hits to build the sentence using Words for Life Software.